Acea further added that the Government of Cuba offers full support for the relatives during this difficult time. 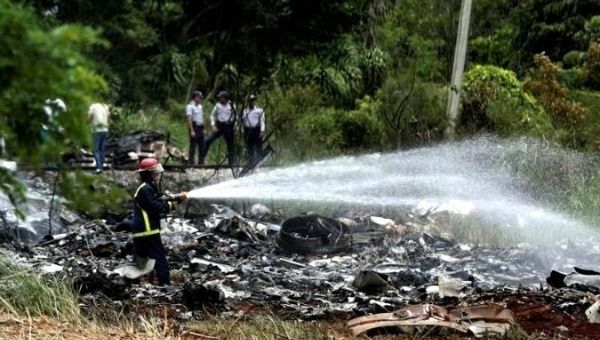 May 19 (teleSUR) The arduous task of identifying the victims of the Cuban plane crash has begun with a member of the Political Bureau of the Central Committee of the Party and first secretary of the organization in Havana, Mercedes López Acea, present to offer comfort to the bereaved. Acea used the opportunity to extend support to the relatives of some 110 victims of the plane crash which occurred at about midday Friday, in Havana. The first secretary also conveyed the condolences of Army General Raul Castro, First Secretary of the Central Committee of the Party as well as President Miguel Díaz-Canel. The Council of State of the Republic of Cuba announced a day of mourning for the victims of the tragic crash. Acea further added that the Government of Cuba offers full support for the relatives of victims of the crash, during this difficult time. Several governments in Latin America and across the world have united in solidarity with the Cuban people, sending numerous messages of support and encouragement, urging strength and hope. The Institute of Legal Medicine initialized the process for the relatives to identify their loved ones who perished on the ill-fated Boeing 737-200, which crashed shortly after taking off from Havana’s main airport on a domestic flight. Cubana de Aviacion flight CU972 departed the capital at 11:00 a.m. en route to Holguin with 114 passengers and crew on board. According to Reuters, there were five foreign passengers and crew but the majority were Cuban nationals. The Mexican Government said, on its website, that the plane was a Boeing 737-201 built in 1979.